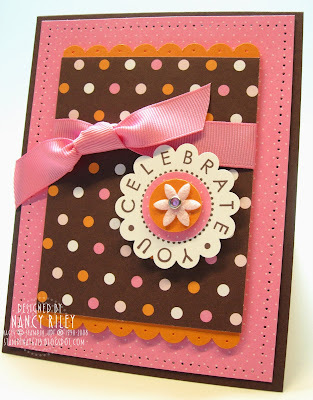 I've used Beate's Weekend Sketch Challenge #64 for the layout of this card, and u sed my new stamp set Party Hearty. I love how this image fits perfectly into the Scallop Circle Punch! 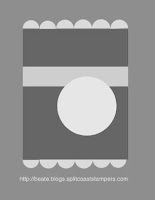 The possibilities are endless for layering this circle image! I also used my favorite designer paper, Sweet Always. Wow Nancy - this is fantastic! I love this paper too. Nancy, this is awesome. I love it! Look at you, all famous all over the place! Super cute, I love that paper!! This is wonderful, Nancy!! I love that paper, too!! I love the colours and layers! What an awesome looking card. This is stunning! I love everything about it! Soooooo cute! This sketch was perfect for the Party Hearty set!! Looks fabulous with this paper too, excellent work! Your card is gorgeous...just like everything else you make! OH my Word! This card is fabulous! I love how you've used the scallop circle punch with that stamp, and the papers are just perfect! This is beautiful Nancy! The piercing looks fabulous! Great colors! TFS! Fantastic card! 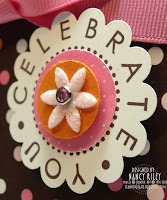 I love how the scalloped Celebrate You pops from the card and the colors are so fun! I love this Nancy. Colors are awesome!! I've missed your daily posting but you really do a good job posting as much as you do with a full-time job. You are amazing. SWEET! I didn't realize that would fit in the scallop punch....don't have that set anyway, but what a great selling feature! THANKS! Beautiful take on the Sketch!!! Love the DP and the Set you've used!!!! Awesome Nancy!!! I love this DP and your medallion you created is fabulous girl!!! Nancy this is ADORABLE! LOVE the color combo & yep the set you used! This is just fabulous Nancy! Love your colours and that little felt flower finishes it perfectly! Super cute!!! I really need to get that Sweet Always paper! This is so pretty, Nancy!! I love the colors, and all of your polka dots!! I love your piercing and wonderful sentiment as well!! This is just darling!!! I have totally overlooked that DP and I LOVE it here -- such a fun little scallop!!! TFS! !